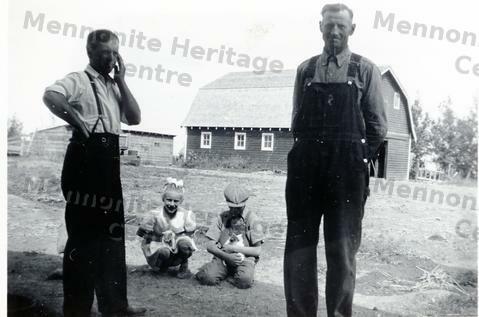 This is a photo taken on the Jacob Reimer Farm in the Coaldale area of Alberta. Heidi Koop and a boy are in the mid ground playing with kittens while two men, Peter Koop(left) and Jacob Reimer(?) are standing in the foreground. One is wearing overalls. A hip roof barn stands in the background.